RIH Asia specifically covers Chinese, Korean and Japanese watchmaking publications. 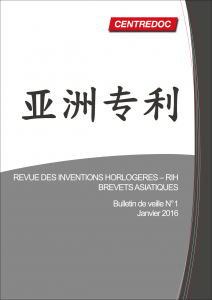 This monthly patent monitoring perfectly complements RIH, for anyone wishing to keep abreast of the latest technological developments in the Asian watchmaking industry. While Japanese companies have been active in the field of intellectual property for many years, nowadays Chinese and South Korean companies are also seizing upon this legal protection tool. This observation, which applies to most industrial sectors, is also true for the watchmaking field. However, for reasons of access and language difficulties, Asian patents still frequently evade monitoring. However, for Western watchmakers active in these countries, it is becoming vital to monitor the activity, constantly intensifying in both quantitative and qualitative terms, of their Asian challengers. This publication is released 12 times a year in electronic and paper format. The rates indicated are excluding taxes. A descriptive sheet of each invention, in English.